Empirical research, ethics, and opinion. In an episode of HBO's Real Time with Bill Maher, October 3, 2014, Maher and his guests engaged in a heated argument about the extent of fundamentalist beliefs among Muslims and the contention that many liberals are unwilling to criticize those beliefs. In the subsequent controversy, some journalists and other writers took up the important task of fact-checking the claims made in that now famous debate. One of the most often attempted corrections deals with Maher's claim that a Pew study showed “like 90%” of Egyptian Muslims support death as a punishment for leaving Islam. Many who try to correct him allege that the correct Pew figure is 64%. This article fact-checks those claims and a few related ones by looking to the original Pew source documents, researchers, and data. The Pew Research Center survey report most often cited in this controversy is titled The World’s Muslims: Religion, Politics, and Society (April 30, 2013). In the Complete Report (April 30, 2013)  and in the Topline Questionnaire , in a table on page 219 are shown the percentages of Muslims in each country listed, with each kind of response to Q92b, “Do you favor or oppose the following: the death penalty for people who leave the Muslim religion.” The table on p. 219 shows that 88% of Egyptian Muslims favored the death penalty for apostasy, 10% opposed it, and 1% didn't know or else refused to answer. The table shows a wide range in support for the punishment, from about 1% in Kazakhstan to 88% in Egypt, with support in most countries below 50%. (I've plotted those percentages here). (Update, April 2, 2015: Pew republished these apostasy data in an interactive format here. Click on the preview chart icon option to see the numbers. Pew labels the years for these data as 2010 and 2012). Note: I will be referring to the 2013 Complete Report throughout this article, so readers should keep it available for reference. Pew also published a brief article by Sahgal and Grim (July 2, 2013), highlighting some of the extreme restrictions on religion in Egypt. They wrote (parentheses are theirs): “Egyptian Muslims also back criminalizing apostasy, or leaving Islam for another religion. An overwhelming majority of Egyptian Muslims (88%), say converting away from Islam should be punishable by death.” An earlier Pew study (2010b) found that 84% of Egyptian Muslims supported death for apostasy. Pew made available to the public (June 4, 2014) the Data Set  from which the percentages shown in the 2013 Complete Report were derived. Using freely-available statistical software , I've produced tables that will help clarify some issues about the numbers. Table 1 shows the distribution of responses for Egyptian Muslims for Q92b. Those are the raw, unweighted data. As mentioned in the Complete Report, p. 150, in Egypt there were 1798 Muslim respondents included in this study. If we divide 1587 by 1798, we get 88.26%, but Pew's reported percentages are calculated on weighted data. When we apply Pew's weight variable in the analysis as directed, we get the results shown in Table 2 below, which I've expressed as percentages. In the Complete Report (2013), Pew rounds off the numbers for presentation. Pew (2013) also provides the percentage of Muslims who favored making sharia—a comprehensive set of laws—the official law of the land in their country (e.g., 74% for Egypt, as shown in the Main Report, Chapter 1: Beliefs About Sharia, under the heading “Sharia as the Official Law of the Land”; and on pages 46 and 201 of the Complete Report, Q79a). The percentage of sharia-supporting Muslims who favored the death penalty for apostasy (e.g., 86% in Egypt) is given in the Main Report, Chapter 1: Beliefs About Sharia, under the heading “Penalty for Converting to Another Faith”; and on p. 55 of the Complete Report. Whether Maher got his “90%” approximation for Egyptian Muslims appropriately from the 88% on p. 219 of the Complete Report, or inappropriately from the 86% in Chapter 1 of the Main Report (or p. 55 of the Complete Report), or from some other source, I don't know. In Table 3a, below, I show a cross-tabulation summarizing the weighted frequencies, expressed as percentages of the total, of Q79a (rows) by Q92b (columns) for Egyptian Muslims. From the favor-sharia row, we can calculate the percentage of sharia-supporters who favored death for apostasy by dividing .6380 by .7393, to give us .863 or 86.3% (p. 55, Complete Report). In contrast, 12.3% of sharia-supporters (.0908 / .7393) opposed death for apostasy. Interestingly, about 19% of Egyptian Muslims overall opposed making sharia the official law of their country but favored the death penalty for apostasy. That response combination also occurred in other countries to varying extents, but was especially high in Egypt and Jordan. I discuss those kinds of responses in Part 2, but for now I will note that this subset in Egypt that supports the death penalty for apostasy but not sharia (as presented in Q79a) may consist of respondents of at least a few different kinds, including those who support some sharia but not a comprehensive implementation of it; or support sharia as a source of law, but not as the only source of law; or who support sharia but regard the nation state as un-Islamic and want it replaced by a purely Islamic system under a Caliphate. I provide evidence to support these possibilities in Part 2. 88% of Egyptian Muslims favored the death penalty for apostasy. 86% of the Egyptian Muslims who favored sharia favored the death penalty for apostasy. 64% of Egyptian Muslims favored both sharia and the death penalty for apostasy. Note that the percentage for that latter response combination (64%) should not be confused with the percentage of Egyptian Muslims overall who favored the death penalty for apostasy (88%). Unfortunately, that confusion was made in a widely-cited secondary source. By his own account, he acted on the beliefs that Pew didn't provide the statistics for the overall samples, and that he could extrapolate them from the limited information that he did have. Apparently, he overlooked the report materials, which do provide the statistics for the overall samples. The report materials are available via links from the opening page of the Main Report. For each country that he included in his calculations, he apparently multiplied the proportion supporting sharia (e.g., for Egypt, .74) by the proportion of sharia-supporters favoring death for apostasy (.86 for Egypt) to get what he described as the percentage of Muslims who supported the death penalty for apostasy (for Egypt, about 64%, or 63.64% based on multiplying the rounded figures). If he didn't use that method, he probably used something similar. The cross-tabulation of the data for Egypt in Table 3a, for example, shows that he obtained the wrong numbers. (Also see Table 3b for Pakistan, below). On p. 219 of Pew's (2013) CompleteReport, the table shows that 79% of Muslims in Afghanistan and 75% of Muslims in Pakistan favored death for apostasy. I provide here in Table 3b a cross-tabulation of the Q79a and Q92b results for Pakistan, drawn from the data set according to the same procedure as used above for the Egyptian data. Readers can compare the totals of the rows and columns in Table 3b with the rounded numbers for Pakistan on pages 201 and 219, respectively, of the Complete Report (Pew, 2013); one difference is that I show the “don't know” and “refused” responses separately (as they are in the data file) whereas Pew merges them in the report. On October 15 (2014), I emailed the Washington Post, notifying them of the erroneous numbers in Fisher's May 1, 2013 article (and in another article  by him, dated May 2, 2013), providing them with a link to the Complete Report, and citing page 219. On or about October 28 or 29, they made a partial correction  to Fisher's May 1, 2013 article, changing the title and stating in the text that 88% of Egyptian Muslims favored the death penalty for apostasy. However, the corrected article contained other errors, including a new error stating that 62% of Pakistani Muslims favored the death penalty for apostasy. On October 27 (2014), I also notified the Washington Post about an article by Christopher Ingraham (October 6, 2014)  that made the same kind of error with the Pew (2013) adultery data as Fisher had made with the apostasy data. To their and/or the author's credit, the Ingraham article was subsequently corrected. (For a summary of my attempts to get various sources to correct their numbers, see Appendix III). Some sources reported Pew's (2013) apostasy numbers correctly. I haven't done a thorough search, but here is a brief, casual, non-scientific sample of people who got the apostasy numbers right: Eugene Volokh (May 2, 2013); Andrew Bostom (May 4, 2013); Shadi Hamid (2014) ; and Nicholas Kristof (October 8, 2014). Obeidallah mentioned the 2013 Pew study, but linked to the Washington Post article. His “less than 5%” for Turkey is also incorrect—the actual Pew (2013) figure is 8% (p. 219). On October 9, 2014, Obeidallah tweeted a link to Nicholas Kristof's (October 8, 2014) New York Times article. Kristof's article, as I noted, contained a correct presentation of the apostasy numbers and the link to Pew's (2013) Complete Report. Obeidallah was then asked in the ensuing thread about his own use of the 64% figure for Egypt. He replied that it came from the Washington Post article and its title. A couple of minutes later his correspondent replied, alluding to page 219 of the Pew report, but there was no response from Obeidallah. Several days later, his correspondent gave more explicit reference to p. 219, the 88% figure for Egypt, and the link to Pew's Complete Report, but there was no response from Obeidallah. His article on CNN Opinion remains uncorrected as of January 18, 2015. Chris Hayes (New York): "I want to cite this poll that Bill Maher and Sam Harris, who is an atheist author who was on Bill Maher, who sort of have, have built a lot of this around. This is a Pew Research poll. I think it was conducted in 2013 of different views. [3:03, a graphic display is shown of two percentages and the reference to the April 30, 2013 Pew report] This is views of Egyptian Muslims: 74% of Egyptian Muslims say sharia should be official law—that is, of course, sort of Qur'anically-derived religious law—and 86% of those say that there should be a death penalty for converts, for people who leave Islam. Now, that's about 60% of folks when you multiply those two—64% that—when you multiply those two together. [3:23, the graphic display is removed, image returns to Hayes and Aslan] Now, that's a troubling polling result, I think both you and I would agree, right?" As Hayes says, and as confirmed by his mention of the 74% and 86% and the graphic display of the numbers and the reference, he at least thinks he is talking about the (April 30, 2013) Pew report of Muslims' views. Hayes' multiplying of the two percentages to get 64% is consistent with Fisher's extrapolation; Pew didn't do that in their report. Aslan strongly implies, to the naïve viewer, that he's read from the same Pew report, particularly when he says “that very same poll showed that...” and “until you read the rest of the poll, wherein...” In addition to Aslan's 64% error for Egypt, page 219 of the Complete Report shows that his 12% for Tunisia and 5% for Turkey are incorrect; Pew's figures are 18% and 8%, respectively. His errors for Tunisia and Turkey are not large. What's more significant about them—together with his 64% error which is quite large—is that they suggest that he is unaware of p. 219 of the Complete Report (or Topline Questionnaire). Note also that his three errors thus far are all lower than the Pew apostasy figures. Aslan's approximation for Lebanon, phrased as “one in six,” happens to be consistent with the 17% on p. 219. However, “one in six” is used to refer to 15%, 16%, 17%, or 18% , so the linkage to the 17% on p. 219 is not clear. It's possible that Aslan read the 17% figure on p. 219 of the Complete Report and merely changed the phrasing, but his errors on all the other numbers make it very unlikely that he read p. 219. In a later interview with Hartmann, discussed below, Aslan describes the figure for Lebanon incorrectly as “10 or 9%,” which supports the idea that he hadn't read p. 219. His alleged “75% of Egyptians” who “wanted religious freedom,” with his comment that this sounds like (or is) a contradiction in light of the apostasy results for Egypt, is similar to Fisher's statement in the original (May 1, 2013) Washington Post article. Fisher introduced the alleged “75 percent of Egyptians” who supported religious freedom and contrasted that with the apostasy result, saying “It might seem like a glaring contradiction. And it is a contradiction...” (I investigate their “75%” claim below). Among the Egyptian Muslims who supported sharia (74%), Aslan claimed that the “poll showed” that there was a “massive diversity” in what they “meant” by sharia. I'm not sure whether Aslan, in his response to Hayes' question, meant to imply that 74% of Egyptian Muslims supporting making sharia the official law of the country isn't troubling. What Pew reported for this sharia-supporting subset of Egyptian Muslims is that 86% favored the death penalty for apostasy, 81% favored stoning of adulterers, 70% favored the use of punishments such as whipping and cutting off of hands for crimes like theft, 95% favored giving Muslim leaders and religious judges the power to decide family and property disputes, and 74% said sharia should be applied to both Muslims and non-Muslims (see pp. 48-55, Complete Report). I think if Aslan had read the Pew report, he would have found the 74% support for sharia to be troubling, given that most of the sharia-supporting subset in this case supports extremely harsh sharia punishments. I address Aslan's claims about the diversity in the meaning of sharia for Egyptian Muslims further in Appendix V.
Aslan also spread the 64% error via Twitter: “64% of Egyptians favor death for apostasy. 75% of Egyptians favor full religious freedoms. That contradiction sums up how religion is LIVED.” (6:08 PM - 13 Oct 2014). When the author of Uncertainty Blog challenged Aslan's 64% figure, Aslan (6:13 PM - 13 Oct 2014) tried to correct him, replying “@uncertaintyblog nope. 64%,” adding a link to the original Fisher (May 1, 2013) Washington Post article and an image of a Pew (2013, p. 55 Complete Report; or from the Main Report) bar plot that was reproduced in that article. The Pew bar plot in question shows the percentages of sharia-supporting Muslims—not the overall percentages of Muslims—who favor the death penalty for apostasy. On its Facebook page (October 11, 2014), AslanMedia presented and linked to the Washington Post article by Christopher Ingraham (October 6, 2014)  mentioned above, that contained erroneous apostasy and adultery numbers. In citing that article, AslanMedia directed readers to an erroneous secondary source instead of the primary source. Aslan dismissed the Pew numbers for Egypt (86%) and Pakistan (76%) without explaining to viewers why those numbers were not appropriate as his host described them. Hartmann evidently didn't have the appropriate data prepared, and did not question Aslan about his numbers. Aslan conveys firm confidence about the numbers, matter-of-factly "correcting" Hartmann with the 64% figure, and talking about the "complicat[ion]" of the religious freedom result that appears to contradict the apostasy result. Again, he gives the impression, to the naïve viewer, of someone who has read the Pew survey. Note the downward migration of Aslan's numbers for Tunisia and Lebanon, and the change in phrasing for Turkey, since his interview with Chris Hayes. I've summarized in Table 4 the relevant Pew (April 30, 2013) and Washington Post (May 1, 2013) numbers for comparison with the various numbers Aslan mentioned in the two interviews. Like the 64% figure for the apostasy question, the figure of 75% (or the phrase “more than 75%”) support among Egyptian Muslims overall for religious freedom is not mentioned in the Pew (2013) report. Aslan's phrasing also changed, from “religious freedom” in the Hayes interview (Oct. 13, 2014, 8-9 pm, ET) and “full religious freedoms” on Twitter (Oct. 13, 2014, 6:08 pm, PT), to “full religious freedoms for all Egyptians” in the interview with Hartmann (Oct. 20, 2014). If a respondent answered "very free" to Q10, and said that that was "a good thing" in response to Q11, Pew deemed that response combination to indicate support for the religious freedom of non-Muslims. On p. 63 (Complete Report), Pew shows data for Muslims who said, in response to Q10, that non-Muslims were "very free" to practice their (non-Muslim) faith in their country (e.g., Egypt). Pew indicates on pages 62, 63, and 172 of the Complete Report that that subset is 31% of Egyptian Muslims overall. Of that 31% of Egyptian Muslims, 77% said that non-Muslims being very free to practice their faith was a "good thing" (p. 63). Note that a caption at the bottom of the bar plot on p. 63 states that those results are “Based on Muslims who say people from other religions are very free to practice their faith.” 77% of the 31% subset is 24% of Egyptian Muslims overall. Indeed, the table for Q11 on p. 173 shows that 24% of Egyptian Muslims overall said non-Muslims were very free and that that was a good thing. In other words, applying Pew's own measure of Muslims' support for the religious freedom of non-Muslims to the general sample, we find that only 24% of Egyptian Muslims support it. But Fisher appears to have taken the 77% of the subset as "more than 75 percent" of Egyptian Muslims overall. His "95 percent" claim for Pakistan also involves the same kind of error. Aslan reported the same erroneous figure as did Fisher for Egypt, possibly due to having misread or not having read the original report, or due to having relied on Fisher's article. 31% of Egyptian Muslims say that non-Muslims are "very free..."
77% of the Egyptian Muslims who say that non-Muslims are "very free..." say that that is a good thing. 24% of Egyptian Muslims say that non-Muslims are "very free..." and that that is a good thing. In the Complete Report there were three questions addressing “religious freedom” explicitly using that phrase or referring back to it, Q9, Q10, and Q11. Those questions and the results for them are shown on pages 171, 172, and 173, respectively, of the Complete Report. Brief selective summaries of the results for those questions are shown on pages 62 and 63 of the Complete Report. Q9 asks, “In our country, how free are you to practice your religion? Do you feel very free to practice your religion, somewhat free, not too free, or not at all free?” Results for Egypt: Very free = 46%, Somewhat free = 36%, Not too free = 18%, Not at all free = 0%, Not religious/do not practice religion (VOL: volunteered) = 0%, Dk/Ref. = 0%. Pew reports that 46% of Egyptian Muslims say they are very free to practice their religion in Egypt (p. 62). However, Q9 doesn't ask them whether they want, support, or should have freedom to practice their religion. It asks them to judge how free they are to do so. Among the countries surveyed using the standard version of Q9, Egypt had the lowest rated religious freedom (see p. 171). (Muslims in Uzbekistan and Russia were asked a different version). Q10 asks, “And in our country, how free are people from religions different than yours to practice their religion? Are they very free to practice their religion, somewhat free, not too free, or not at all free to practice their religion?” Results for Egypt: Very free = 31% Somewhat free = 32%, Not too free = 17%, Not at all free = 1%, Depends (VOL: volunteered) = 10%, Dk/Ref. = 9%. Like Q9, Q10 does not ask people whether they want or support religious freedom. Again, Egypt had the lowest rating on the standard version of Q10 (see p. 172). (Muslims in Uzbekistan and Russia were asked a different version of the question: “And in our country, how free are people of other religious views to practice their religion or express their religious or anti-religious views?” Because this alternate version adds more stringent criteria, particularly the freedom to express anti-religious views, it would probably elicit lower religious freedom ratings than the standard version asked in all the other countries in the table on p. 172). The instructions for the interviewer for Q11 were as follows: “ASK IF VERY, SOMEWHAT, NOT TOO OR NOT AT ALL FREE (Q10 = 1,2,3,4) Q11. And is this a good thing or a bad thing?” (p. 173). Those whose responses were classified as “Depends” or “Don't know/Refused” for Q10, who together made up about 19% of the total respondents, were not asked Q11. In Table 5, for clarification, I've arranged the percentages from the Q11 results table on p. 173 of the Complete Report in a cross-tabulated format and have summed the rows and columns. Note that there is some slight rounding error in the totals due to summing the rounded numbers from p. 173, but they are approximately correct. Pew uses the “very free—good thing” response combination as its measure of support for religious freedom for people of other religions (e.g., see p. 63, Complete Report). Fisher may have got his notion that “more than 75%” of Egyptian Muslims support “religious freedom” from the section on Religious Freedom in Chapter 2 of the Main Report (or p. 63 of the Complete Report), which shows that 77% of the Egyptian Muslims who say people of other religions are very free to practice their faith also say this is a good thing. That is clearly of a subset, not of a general sample. That would be, roughly, .24 / .31 = .774, or 77% of the Very free row in Table 5. That is only 24% of Egyptian Muslims overall. Obtaining somewhat more precise figures from the data file, again including Pew's weight variable in the calculation, we find .2413 / .3148 = .767, or 77%, as shown on p. 63. (In light of the information obtained from the data file, it seems that the 31% shown on p. 62 and mentioned on p. 63 indicating the percentage of Egyptian Muslims who say people of other religions are very free to practice their faith, is rounded from about 31.48%). It is unclear whether holding the view that people of other religions are “somewhat free” and that this is a “good thing” (23%) should be considered truly supportive of religious freedom. For the moment, let's generously assume that it is. Another possible origin of the “75%” involves dividing the percentage who said it was a good thing that people of other religions were at least somewhat free to practice their religion (.24 + .23) by the total who thought that people of other religions were at least somewhat free to practice their religion (.3148 + .31), or .47 / .6248 = .75, or 75% (roughly). As we've seen above though, on a generous reading, that's only about 47% of Egyptian Muslims overall. One way or another, it looks as though Fisher confused a percentage taken from a subset with an overall percentage. He also presented the support for religious freedom as general, whereas Q11, following up on Q10 specifically, pertains only to religious freedom for non-Muslims. Aslan's claim that “75% of Egyptians want full religious freedoms for all Egyptians” does not seem to be based on a direct reading of the Pew report, but is more likely based on a misunderstanding of Fisher's erroneous statement, compounded by Aslan's own embellishment. From Table 5 we can also see that among respondents who said that people of other religions were at least somewhat free to practice their religion, (.05 + .06) / .6248, or 17.6% (roughly), said that this was a bad thing. Only 4% of Egyptian Muslims overall said that it is a bad thing that people of other religions are not too free or not at all free to practice their religion. If we add that 4% to the 47% who supported the idea of people of other religions being at least somewhat free, we get about 51% of Egyptian Muslims seemingly supportive of people of other religions being at least somewhat free to practice their religion. There are some interpretive complications. Take for example the 5% of Egyptian Muslims who say that people of other religions being somewhat free is a bad thing. Some might support religious freedom for others, but deem “somewhat free” as not free enough (a bad thing). On the other hand, some might regard “somewhat free” as too much freedom (a bad thing). The same kind of ambiguity arises in interpreting the “somewhat free – good thing” subset who constituted 23% of the respondents. Next, consider the 24% overall who responded “very free – good thing.” According to Pew, Egypt is one of the most restrictive countries regarding religious freedoms, including for non-Muslims. This 24% of Egyptian Muslims may have an unrealistically positive view of the state of religious freedom for non-Muslims in their country, or they may have very low standards as to what constitutes religious freedom non-Muslims. From a practical standpoint, if they believe non-Muslims are already very free in Egypt, they are less likely to want to change the status quo. The 6% of Egyptian Muslims who say non-Muslims being very free is a bad thing may be supportive of further restrictions. Only about 4% of Egyptian Muslims seem to have a recognition of the restrictions on non-Muslims overall in Egypt and view this lack of freedom as a bad thing. This small minority is outnumbered by the 12% of Egyptian Muslims who think the lack of freedom for non-Muslims is a good thing. Contrary to Aslan's claim about “full” religious freedoms, respondents were not asked about full or complete religious freedom(s). As we've seen, the explicit response categories ranged from very, to somewhat, to not too, to not at all free. “Fully free” is not one of the categories. While the lowest section of that range implies zero, the highest section does not necessarily imply full, complete, or total religious freedom. Exactly what implied meanings would arise in translation is another matter, of course. But even if we assume that “very” meant “fully” to every respondent who said “very free,” that gives us only 24% of Egyptian Muslims overall who said this was a good thing for people of other religions; see above. Nor does “very free” necessarily imply, for all or even most respondents, the idea that one is free to leave Islam with impunity. Perhaps some respondents answering Q10 and Q11 didn't think of apostates from Islam as examples when thinking of people of other religions. For most Egyptian Muslims, “free” may be conceived within a double standard, wherein converting to Islam is a good thing while converting out of Islam is a terrible crime: 88% overall agree that Muslims have a religious duty to convert others to Islam (Q52, pp. 112-113, 189), while 88% overall think people should be killed if they leave Islam. Possibly, some of the respondents who supported religious freedom for others and opposed the death penalty for apostasy could be consistent supporters of religious freedom, but we would need more information, such as whether they support any penalties, such as jail, corporal punishment, and so on, for apostasy. Moreover, the freedom to leave a religion is only one of the important aspects of religious freedom that would need to be considered. Fisher's claim that “more than 95%” of Pakistani Muslims support religious freedom again appears to involve a confusion of the results from a subset with those of the overall sample. On p. 63 of the Complete Report, the bar plot shows that 96% of the Pakistani Muslims who said people of other religions were very free to practice their religion said this was a good thing. As we can see from the table for Q11 responses on p. 173 of the Complete Report, 72 out of (72 + 3), or .72 / .75 = .96, or 96% of those who responded that people of other religions were very free said this was a good thing. But overall, 72% of respondents indicated that people of other religions being very free to practice their religion was a good thing, and 11% said the same for those who are somewhat free. If we add that 11%, and the 3% who said that it was a bad thing that people of other religions were not too free or not at all free, we get about 86% overall who seem to support the idea that people of other religions should be at least somewhat free. The remainder either didn't support religious freedom or had no definite response. But does this really mean that 86% of Pakistani Muslims support religious freedom for people of other religions? Generally speaking, questions asking people to either support or oppose concepts described in broad positive terms, like freedom, peace, justice, equality, etc., are likely to get high levels of support, even among fundamentalists and militants. Due to this kind of ambiguity, it's necessary to also ask more specific questions when very broad general questions are asked. If we define support for religious freedom as requiring, at minimum, opposing the death penalty for those who have converted from Islam to another religion, then only small minorities in Egypt (10%) and Pakistan (16%) remain as possibly supportive of religious freedom for people of other religions. If one were to also include, in one's definition of religious freedom, opposing harsh punishments for people of other religions who publicly criticize Islam or Muhammad, the support for religious freedom would likely be smaller. The 2013 Pew Research study at the center of this controversy reports that 88% of Egyptian Muslims support the death penalty for people who leave Islam (p. 219, Complete Report). That happens to be close to what Maher claimed. His critics who claimed that the actual Pew figure in question was 64% were mistaken. In many cases his critics were relying on an erroneous secondary source from the popular media instead of reading the original Pew source with due diligence. Those who claimed that 75% (or more) of Egyptian Muslims supported religious freedom seem to have not read or have misread the Pew (2013) report, which shows that only 24% of Egyptian Muslims overall responded that people of other religions in their country were very free to practice their faith and that this was a good thing (p. 173, Complete Report). Pew used the “very free—good thing” response combination as its measure of support for religious freedom for people of other religions (e.g., see p. 63, Complete Report). I also considered a different measure that included “somewhat free”: At most, about 47% to 51% of Egyptian Muslims overall supported religious freedom for people of other religions, assuming that being at least “somewhat free” is considered an adequate level of freedom. But when we use opposition to the death penalty for apostasy as our measure, only about 10% of Egyptian Muslims support religious freedom. In Part 2, I will examine and present data bearing on the more general question debated by Maher and his guests in the Oct. 3, 2014 episode of Real Time, namely, what percentage and numbers of Muslims overall hold fundamentalist views that are contrary to human rights? I will also explore some possible reasons why some respondents opposed sharia as the official law of their country but favored some particularly harsh elements of sharia such the death penalty for apostasy, stoning for adultery, or corporal punishment such as whipping and cutting off of hands. I would like to thank Dr. James Bell of Pew Research for responding to my queries, Bloomberg View for correcting their Pew apostasy number, the Washington Post for attempting to correct their Pew apostasy numbers, and the author of Uncertainty Blog for showing a genuine interest in the process of getting the numbers right and for inviting me to post a guest article. I would also like to thank the Pew Research Center for making several of their data sets available to the public. Maher's claim, as I heard it, about 8:00 into the above  clip: “I can show you a Pew poll of Egyptians—they are not outliers in the Muslim world—that say like 90% of them believe that death is the appropriate response to leaving the religion.” Out of context, his use of the term “Egyptians” is too general, because the study in question reported on the results for Egyptian Muslims. In context, I believe Maher was referring to Egyptian Muslims. Which Pew survey Maher was referring to is not entirely clear, though “90%” is more consistent with the 2013 Complete Report, p. 219. *[But see May 17, 2015 update, below]. Maher made a similar statement in an interview (posted on Real Clear Politics on September 10, 2014) on PBS with Charlie Rose, but said “over 80%.” From about 1:22 in the linked clip, Maher tells Rose, “There's a Pew poll of Egypt done a few years ago. 82% I think it was, said stoning is the appropriate punishment for adultery. Over 80% thought death was the appropriate punishment for leaving the Muslim religion.” Maher's phrasing “leaving the Muslim religion” matches the phrasing used on p. 219 of the (2013) Complete Report, but also matches the phrasing in the 2010 report (p. 35, and throughout the text, 2010b). For stoning of adulterers, Maher's mention of “82%” support is matched in the 2010 report (p. 35, 2010b), whereas the 2013 report has 81% for the sharia-supporting subset (p. 54) and 80% overall (p. 221). The link in the article goes to the original uncorrected version of Fisher's (May 1, 2013) Washington Post article, not the Pew (2013) study. *Update (May 17, 2015). A more recent comment (May 15, 2015), wherein Maher cites other specific numbers for opinions on adultery and apostasy punishments, indicates that he may have derived his "like 90%" from the 86% support for death for apostasy among the sharia-favoring subset data on page 55. It appears that Maher, like many others, thought the subset data was general sample data. I discuss his recent comment here. I'll call this the Main Report, to distinguish it from the Complete Report. A key difference between the two is that the Complete Report contains “Appendix D: Topline,” whereas the Main Report does not. The (2013) report also includes data from an earlier Pew study of sub-Saharan African countries, titled Tolerance and Tension: Islam and Christianity in Sub-Saharan Africa (April, 2010). Topline Questionnaire. Survey Topline Results. The World’s Muslims: Religion, Politics and Society. Pew Research Center (April 29 or 30, 2013). (I cite this study as 2010b). Data Set (for the 2013 Pew report). The World's Muslims Data Set (Published June 4, 2014). Source: Pew Research Center’s Religion & Public Life Project. Retrieved October 19, 2014. The Pew (2013) Data Set is freely available upon request within some limits and conditions. Note that the Data Set folder contains some pdf files with additional written information about the study, particularly concerning methodological aspects. Of particular interest, the quoted instructions for Q92b (apostasy) are from page 37 of 48, in a pdf file titled Pew Research Center Religion and Public Life Project. The World's Muslims Questionnaire. That file is one of several that come with the Data Set download. In addition, I accessed the Data Set for Tolerance and Tension: Islam and Christianity in Sub-Saharan Africa (April 15, 2010). Note that some of these data are reported in Pew's (2013) report, such as the apostasy data on p. 219. For those who wish to analyze and then report results from Pew's data file, I recommend that only those who have training in statistics and relevant scientific research methods attempt to do so. Those who don't have such training should seek to collaborate with and obtain guidance from those who do. Please see Pew's Instructions for Downloading Data Sets for more information. That said, the data file is available for anyone who wants to explore it, within some limits and conditions . The data can be analyzed using IBM SPSS, or the open source freely-available (but very basic) PSPP, or other major statistical packages that can read SPSS .sav files. I provide instructions for doing a basic analysis of the Pew (2013) apostasy data here. According to Pew: “Data were weighted to account for differences in probability of selection. Additionally, in some cases survey results were weighted to match the demographic characteristics of the population in each country.” Source: Background and Codebook, Pew Research Center, World’s Muslims Data Set, Survey Conducted Oct. 2011 – Nov. 2012. This file is one of several that comes with the Data Set  folder. Max Fisher (May 1, 2013). 64 percent of Muslims in Egypt and Pakistan support the death penalty for leaving Islam. Washington Post. (Original uncorrected version, as viewed December 10, 2014. To switch to the partly corrected version, add a forward slash to the end of the URL. Note that either version could be changed). Max Fisher (May 2, 2013). What the Muslim world believes, on everything from alcohol to honor killings, in 8 maps, 5 charts. Washington Post. (Uncorrected). Max Fisher (May 1, 2013). Majorities of Muslims in Egypt and Pakistan support the death penalty for leaving Islam. Washington Post. (Partially corrected version, as viewed December 10, 2014. To go to the uncorrected version, remove the forward slash from the end of the URL. Article could be changed). Christopher Ingraham (October 6, 2014). Ben Affleck and Bill Maher are both wrong about Islamic fundamentalism. Washington Post. (Subsequently corrected). Shadi Hamid. Temptations of Power: Islamists and Illiberal Democracy in a New Middle East (2014). New York. Oxford University Press. (e.g., see p. 57). Dean Obeidallah (updated 8:17 PM EDT, Tue October 7, 2014). Bill Maher's Muslim Problem. CNN Opinion. http://www.cnn.com/2014/10/07/opinion/obeidallah-maher-muslim-comments/ Viewed December 10, 2014. Reza Aslan with Thom Hartmann (October 20, 2014; posted Oct. 21, 2014). Conversations w/Great Minds P1: Dr. Reza Aslan - What Do Atheism & Islam Have in Common? The Big Picture. Russia Today. Also see this link if there are problems with the one above. Laws Criminalizing Apostasy. Library of Congress. Viewed November 17, 2014. Among Pakistani Muslims, 75% said their country's blasphemy laws were necessary to protect Islam, while only 6% said those laws unfairly target minorities, about 1% said neither/both equally (VOL), 17% said they didn't know, and about 1% refused to answer (source: Data Set ; also see p. 199 of the Complete Report, 2013). Pakistan was apparently the only country wherein the blasphemy question (Q76) was asked in the Pew (2013) study. An alternative measure of a minimum level of support for religious freedom in Pakistan would be the percentage of Muslim respondents there who oppose both the apostasy death penalty and their country's blasphemy laws, which include the death penalty and life imprisonment. As the cross-tabulation of Q76 and Q92b in Table 6 shows, only about 1.6% seem to oppose both. That's assuming that, for these respondents and given the two main explicit response options (needed to protect Islam vs unfairly target minority communities), those who say the blasphemy laws “unfairly target minority communities” (p. 199, Complete Report) show a kind of opposition to those laws, and hence possible support for religious freedom. Would a reasonable reader have known, or have good reasons to believe—without asking Pew or checking the numbers in the data file—that the data on p. 219 of Pew's (2013) Complete Report were of the general samples of Muslims? Here I will discuss some of the pieces of evidence that suggest that the answer to that question is 'yes.' The 2013 report is about Muslims' beliefs, so the default assumption is that when the authors refer to Muslims of a particular country, explicitly or through contextual or other implication, and don't mention or imply a subset of Muslims (e.g., those who favor sharia), they are referring to the general sample of Muslims for a country. The researchers tell us in the report when they are dealing with a subset. For example, on p. 55 of the Complete Report the results for the subset of Muslims who supported sharia are shown and described as such. On p. 202, we see that Q81 was asked of those who favored sharia in response to Q79a. In comparison, in the table on p. 219, there are no indications that the apostasy question Q92b was only asked of a subset of Muslims. Likewise, for the sharia question Q79a on p. 201, there are no indications that it was asked only of a subset, and p. 46 is clear enough that Q79a was asked of the general sample of Muslims. Note the consistency of presentation between Q79a on p. 201 and Q92b on p. 219: neither is preceded by a note referring to a limit or condition on who should be asked the question. Another piece of evidence comes from the consistency in the presentation of the data in the table for Q92b, p. 219, of the Complete Report. The table includes data from an earlier study. These are from the general samples of Muslims in each sub-Saharan African country surveyed. The table includes not only the 2011-2012 data, but also the 2008-2009 data from sub-Saharan African countries presented in a 2010 report (2010a). These earlier data are clearly described as from the general sample of Muslims. On p. 50 (or p. 58 of 331) for apostasy, “leaving the Muslim religion,” the figure for Q95c is labeled “Based on Muslims,” as is the table for Q95c on p. 291 (p. 298 of 331) which gives the instructions to the interviewer and the wording of the question: “ASK IF MUSLIM Q95 And do you favor or oppose the following? ... c. the death penalty for people who leave the Muslim religion.” Also see p. 291 (or p. 221 of 254 of the Topline, 2010a). The only condition mentioned was that the respondent be a Muslim. Note that Q95c (2010a) in the sub-Saharan African study is the same as Q92b for the other countries in the 2013 study. In the 2013 report, these summaries for the sub-Saharan African countries are in the same columns as the more recent data including Egypt, Pakistan, Indonesia, etc. This is a crucial point. The researchers would not have put the data from these two different sets in the same columns unless they were all of the same kind for each country in that table. Otherwise, they would note the differences. The only difference noted is that the data from the sub-Saharan African countries (except Niger) were collected at an earlier time (2008-2009) than the 2011-2012 data. Regional limitations in the survey are noted for Thailand, but the apostasy question was still asked of all the Muslims who were surveyed within those regions. The percentages on page 219 of the (2013) Complete Report clearly differ overall from the percentages, for example, on page 55. As one might expect, support for the death penalty for apostasy tends to be higher among Muslims who support sharia as the official law of their country. Egypt and Jordan are the exceptions, where the percentage of support for the death penalty for apostasy is higher in the general sample than it is among those who favor official sharia (as described in Q79a). In the case of Afghanistan, the level (rounded off as reported) is the same between the general sample and the sharia-supporting subset. Pew's (2013) results for Muslims favoring death for apostasy in Egypt (88%), Jordan (83%), and Pakistan (75%) are consistent with those obtained in an earlier survey from general samples of Egyptian (84%), Jordanian (86%), and Pakistani (76%) Muslims (Pew, 2010b). Pew sources for the above: , . The above instructions indicate that the Q92 set (a, b, c, and d) was asked if the respondent was a Muslim. Three countries are excluded, and variations on the wording of Q92a are given for three others, but Q92b pertaining to apostasy is the same for all Muslims asked. Likewise, for Q92c and Q92d. Aside from three excluded countries, all Muslims respondents in the countries listed on p. 219 of the Complete Report, were asked Q92b, c, and d. There is no condition added where the Q92 set could only be asked if a respondent had given a specific answer on a previous question. This means that those who claim the apostasy question was only asked of those who answered that they favored sharia (answered favor to Q79a) are wrong. *Note that while the Data Set and accompanying files were not directly available to the public until June of 2014, they were at least available for those who commented on the Pew (2013) results in response to the Maher-Affleck controversy in October of 2014. (At the request of the author of Uncertainty Blog I obtained from Dr. Bell permission to quote and photo the message above, with specific contact information cut out at Dr. Bell's request). This section gives a chronological summary of my attempts to get various sources to correct their erroneous presentation of Pew's (2013) apostasy numbers. After October 11 (2014), I became aware that the error had already become much more widespread than I'd realized initially. On October 15, I was finally able to address what appeared to be a main source of the error. Early May, or possibly on April 30, 2013. I emailed Sam Harris to correct him re his tweet of the erroneous “64%” figure for Egypt, and provided the reference to page 219 of the Pew report. Result: I don't know. (No reply to initial email). [Update: Harris cited the correct apostasy number (88%) in a blog post, September 28, 2015, linking to my brief guest article version of the above fact-check. In August of 2015, I had emailed Harris with the correction again, after he issued an open invitation for readers to help him "correct every factual error" he'd ever made. Whether Harris' correct report and link to my guest article resulted from my email, I don't know]. October 9, 2014. Commented to correct author of Uncertainty Blog re “64%” for Egypt. Result: The figure was corrected, then uncorrected, then later corrected again on about October 18, 2014. October 11, 2014. Notified an editor of Bloomberg View, regarding an article titled In Affleck Versus Maher, Everyone Loses (Oct 7, 2014) by Ramesh Ponnuru, where the author makes the 64% error for Egypt in attempting to correct Maher. In my email I cited p. 219 and provided a link to the Complete Report. Result: An editor at Bloomberg View replied the next day, saying he would contact a director at Pew for clarification. Corrected to 88% sometime shortly thereafter. October 15, 2014. Notified Washington Post re errors on apostasy data in Max Fisher (re May 1, 2013, and May 2, 2013) articles, and provided Complete Report link and page 219 reference. Result: On or about Oct. 28 or 29, for the Fisher (May 1, 2013) article, they corrected the apostasy figure for Egypt from 64% to 88%, removed the red bar plot, introduced new error for Pakistan apostasy figure (62%), several old errors remain. October 17, 2014. Notified Max Fisher, who is now at Vox.com, of his erroneous apostasy numbers, provided Complete Report link and page 219 reference. Result: I don't know. (No reply). October 18, 2014. Contacted Primary Researcher of the study in question at Pew for verification of the apostasy numbers on p. 219 and described problem with Washington Post article. I cited Egypt as an example. 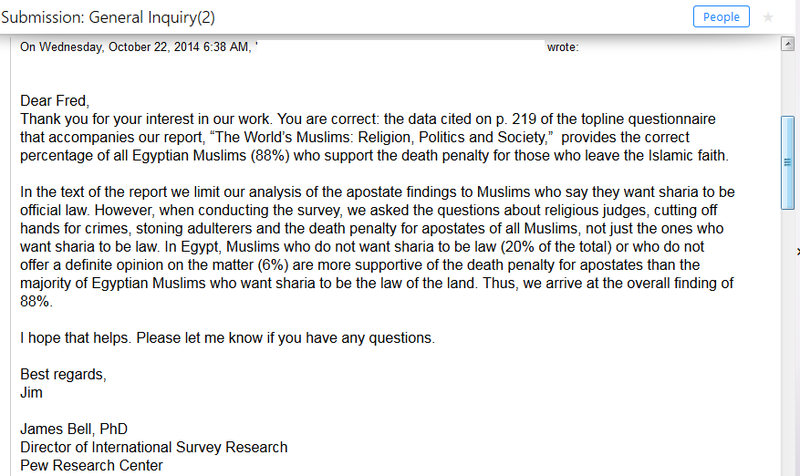 Result: Received reply on October 22 confirming that I was correct re the 88% figure for Egyptian Muslims overall and the data on p. 219 are indeed for the general samples. (Also see October 29, below). October 19, 2014. Obtained the Data Set for the 2013 Pew report, began to analyze it. Result: Confirmed the percentages on p. 219 (general sample) and p. 55 (sharia-supporting subset) of the Pew (2013) report. October 27, 2014. Notified the Washington Post regarding their errors for Pew's apostasy and adultery data in article by Christopher Ingraham (Oct. 6, 2014), provided link to Complete Report and pp. 219 and 221. I told them that I'd confirmed with Pew. Result: Correction was made subsequently, though I don't know when exactly, or whether this was related to my notification to them. (Checked December 10, 2014). October 27, 2014. Notified Christopher Ingraham of his error, provided in email message history the same information given in my notification to the Washington Post. Result: No reply, but see above. Correction made. October 29-31, 2014. Re Fisher, May 1 2013 article, apostasy data. Notified the Washington Post expressing appreciation for their correction of the figure for Egypt, but also informing them of their new error for Pakistan, and the other errors that remained in the text of the article. Result: Except for the 88% for Egyptian Muslims, several errors remain. I had a brief exchange via email with an editor, in which I again cited p. 219 of Pew's 2013 Complete Report and told them I'd confirmed with Pew, but this was to no avail. Not fully corrected as of January 20, 2015. December 1, 2014. Notified Washington Post of the erroneous claim that “more than 75%” of Egyptian Muslims supported religious freedom in the Fisher (May 1, 2013) article; provided link to Complete Report, page references, and explanation. Result: Not corrected as of January 20, 2015. Here is a small non-scientific sampling of writers who mistakenly spread the 64% error, or other errors related to apostasy or religious freedom or the Pew data. If one searches in a web browser the key word combinations such as “Egypt,” “64%,” “Muslims,” “leaving Islam,” etc., a very large number of examples come up. Some examples link to or cite the original Washington Post (May 1, 2013) article, while others don't. Some tried to correct Maher by using the 64% figure, with or without reference to the Washington Post (May 1, 2013) article. I checked these sources again on December 12, 2014, or later. Note that any of these examples may be changed later by their authors or editors. I've categorized the errors. 1. Persuaded, by people purporting to correct them, into relaying incorrect apostasy figure(s). Sam Harris, tweet, April 30, 2013, 7:03 pm. Note that this 64% error occurred before the WP article. Andrew Sullivan, blog post, October 9, 2014. 2. Relayed the incorrect apostasy numbers directly or indirectly from the Washington Post. Daniel Dennett, Facebook post, May 1, 2013, from a GSHM (Global Secular Humanist Movement) citation of Fisher's Washington Post article, May 1, 2013. Allahpundit, Hot Air article, May 1, 2013. (Also includes the false claim that in the Pew (2013) study “Only those Muslims who first said that they support sharia law were asked whether apostates should be executed”). Jonathan Turley, blog article, May 3, 2013. "In Egypt and Pakistan, 64 percent support executing for apostasy.” Source cited is the WP article by Max Fisher (May 1, 2013). Ali A. Rizvi, blog article, Huffington Post, October 6, 2014. For the apostasy data, Rizvi includes a correct link to the Pew (2013) Complete Report, but also a link to the Washington Post (May 1, 2013) article. On January 16, 2015, in an article for CNN, Rizvi quoted the partially corrected Washington Post (May 1, 2013) Fisher article, incorrectly claiming that the Pew (2013) study showed that 62% of Pakistani Muslims support death for apostasy. Razib Khan, blog post, Gene Expression Blog, October 7, 2014. Used the Washington Post's incorrect apostasy numbers from the original uncorrected Christopher Ingraham (October 6, 2014) Washington Post article. Khan discussed the Affleck vs. Maher/Harris incident and tried to get an estimate of the numbers and percentages of Muslims overall who supported death for apostasy. Richard Dawkins, retweet, October 9, 2014. Sally Kohn, interview article, Vanity Fair, December 4, 2014. Where Maher is quoted referring to the “Pew poll” that he claims showed “90 percent of Egyptians” support the death penalty for apostasy, a link to the original uncorrected Washington Post (May 1, 2013) article is inserted instead of a link to the Pew study. 3. Attempted to correct Maher by using [or while citing] the Fisher WP (May 1, 2013) article, misrepresented Pew data. Omar Baddar, article, Huffington Post, May 13, 2014. Rossalyn Warren, article, Buzzfeed, October 6, 2014. Cenk Uygur, video presentation/talk, The Young Turks, published October 6, 2014. Uygur responds to Maher's and Harris' (October 3, 2014, HBO: Real Time with Bill Maher) citation of polls. In a section beginning at about 10:52 in the clip, Uygur makes the usual mistake of confusing the Pew data with the erroneous Washington Post/ Fisher numbers. Uygur said “This,” while looking at a paper and setting up for displaying the red bar plot, “comes from Pew Research Center,” and the “Washington Post wrote an article about it.” But he doesn't tell viewers that the numbers, the red bar plot, and the descriptive title of the red bar plot that he shows and reads from to counter Maher come from Fisher's Washington Post (May 1, 2013) article. When Fisher's red bar plot is on the screen from approximately 11:04 to 11:50, Uygur is talking about the numbers, and the source for the plot is labeled falsely by The Young Turks as “Pew Research Center.” Fisher's labeling of the source as “Pew” is also visible at the bottom of the plot. 13:30 Uygur says of Indonesian Muslims that “a disturbing number, a little over 10% say that apostates should be executed,” while, he says, “closer to 90%” of them say people “should not” be killed for apostasy. According to Pew (2013), 16% favored and 77% opposed the penalty, see p. 219. 15:34 Uygur comments directly on Maher's “90%” figure for Egypt: “And as we just showed you the numbers he's referring to, he actually got it wrong, it's actually a little over 60% of Egyptians believe that, which is still a very disturbing number, but it's not 90%.” Uygur attempts to use the Washington Post/ Fisher numbers to correct Maher's claim about Pew's numbers. Nida Khan, article, Huffington Post, October 14, 2014. Responding to Maher's recent Islam controversy, Khan wrote that his “90%” figure was wrong, and that the “actual figure was 64%.” She linked to the Pew (April 30, 2013) study, but cited and relayed some of the Washington Post's (May 1, 2013) erroneous apostasy and religious freedom numbers. Refers, cites, and links to Fisher's (May 1, 2013) Washington Post article, and links to Pew's (2013) Complete Report, but proceeds to make the same error as Fisher, and says that Maher's claims about Pew's apostasy numbers for Egypt (variously, “90%” or “over 80%”) are wrong. 4. Attempted to correct Maher with 64% figure, but didn't mention the WP (May 1, 2013) article. Ramesh Ponnuru, article, iPolitics, October 8, 2014. (Published in many venues). Ponnuru cites and links to the Pew (2013) study, but uses the 64% apostasy number for Egypt to correct Maher: “Maher overstated his point: It isn’t true, as he asserted, that 90 per cent of Egyptians support the death penalty for leaving Islam. But the true number—64 per cent according to a Pew Research Center poll—is bad enough.” Ponnuru also cited the Ingraham Washington Post (October 6, 2014) article earlier in the piece. Waleed S. Ahmed, article, Muslim Matters, October 9, 2014. To refute Maher, Ahmed includes a link to the Pew (2013) Complete Report. He falsely claims that the Pew report “...offers no direct statistics on Muslims who support capital punishment for apostasy.” He apparently did not read p. 219 of the report to which he linked. He writes regarding those “direct statistics” that “...even if they were to be extrapolated (which introduces an error), the support would be at 64% – not the 90% he so forcefully claimed. Maher also fails to mention the significant disparity Egypt has with other Muslim majority countries on this issue: Indonesia (13%), Lebanon (13%), Tunisia (16%) and Turkey (2%).” (parentheses in original). Ahmed doesn't cite the Fisher (May 1, 2013) article, but it is interesting to note the similar phrasing. Ahmed Benchemsi, article, Salon, October 13, 2014. Benchemsi claimed that the Pew (2013) survey was unreliable. He alleged that respondents were not free to give honest answers due to fear of repercussions. In attempting to correct Maher's “90%” claim, he linked to Chapter 1 of the Pew (2013) report. He apparently used the 86% and 74% figures from Chapter 1 to obtain 64% in order to “correct” Maher. He also linked to the Topline Questionnaire pdf and cited it in an attempt to support a different allegation against the researchers, but apparently didn't reach p. 219 that has the apostasy data. Omar Sarwar, article, Huffington Post, November 6, 2014. 5. Attempted to support Maher using erroneous apostasy figures from the Washington Post. Siggins cited the Pew (2013) survey and the then-uncorrected Washington Post article by Ingraham (October 6, 2014) for erroneous apostasy figures, and even quoted some of them incorrectly from Ingraham. 6. Erroneous 64% figure is given, but no source is mentioned. Kashif Chaudhry, blog article, The Express Tribune, October 17, 2014. Chaudary doesn't directly accuse Maher of having the wrong numbers. He cites the 64% figure for Egyptian Muslims and a couple of other figures that are consistent with the Washington Post's (May 1, 2013) apostasy numbers but provides in the article no mention of or direct references to sources for them. 7. False claim made that only Muslims who favored official sharia were asked the apostasy question. Wikipedia, article on apostasy, as it appeared January 19, 2015. Note that Wikipedia refers to the Pew (2013) report as the “2012 Pew Survey,” and links to the Main Report, which opens to show Chapter 1 and on the right hand side the “Report materials” including the Complete Report and the Topline Questionnaire, which they apparently ignored. 8. Erroneous description of Pew's religious freedom data. Dan Merica, blog article, CNN Religion Blogs, April 30, 2013. “Despite views that Islam should influence politics and law, an overwhelming number of Muslims told Pew that religious freedom was a good thing. The medians for Muslims overall can be obtained from the “very free—good thing” column on p. 173, as follows: South Asia 66%, Eastern Europe 70.5%, Sub-Saharan Africa 74.5%, and Middle East North Africa 47%. (For the two regions Merica didn't mention, SE Asia and Central Asia, the medians were 50% and 48%, respectively, see p. 173). Economist.com, article, April 30, 2013. Although the Economist's correction didn't describe that error explicitly, another article that reproduced what could be the Economist's original uncorrected first chart indicates that the error involved the confusion of results for a subset with overall results for Muslims on religious freedom. 9. In the wake of the Oct. 3, 2014 episode of Real Time, broad unsubstantiated allegation that Maher's factual or statistical claims are false or fabricated. Aymen Mohyeldin, interview remarks, with Lawrence O'Donnell, MSNBC, October 8, 2014. In fact, Maher at least referenced Pew on his apostasy number for Egypt. On May 14, 2014, Mohyeldin cited Omar Baddar's article (see above) as a refutation of Maher's comments about Islam in May, 2014 (Baddar made the 64% error for Egypt in attempting to correct Maher by using Max Fisher's erroneous May 1, 2013 article). On October 6, 2014, Mohyeldin linked to the Pew (2013) survey in an apparent attempt to support his broad accusation that Maher's and Harris's “misinformed” claims were “not based on fact.” Though he provided a link to the Pew (2013) source, he didn't show that any factual or statistical claims made by Maher or Harris were false. 10. Miscellaneous/General: False claims, recklessness, and/or conceptual confusion among influential people reporting the Pew apostasy numbers in various media. [Update, added November 1, 2015] On April 30, 2013, Jeffrey Goldberg misread a secondary source (The Economist) presentation, mistaking the sharia subset for the general sample results, and tweeted it. In claiming that "almost 90%" of Egyptian Muslims favored death for apostasy, Goldberg happened to be consistent with Pew's report, because both 86% (subset) and 88% (general) are almost 90%. Glenn Greenwald, who was also apparently unaware of the primary source figures, then tried to correct Goldberg's misreading of the secondary source, but added a slightly inaccurate number ("72%") for the percentage of "Egyptians" who "believe in sharia law." Goldberg then tweeted a "corrected" (but false) claim that "Roughly 65 percent of Egyptian Muslims support death for apostasy." Goldberg and Greenwald were apparently unconcerned with consulting the primary source report for the correct general sample figures for Egyptian Muslims on the apostasy question. 65% said sons should have greater inheritance rights, 6% said daughters should have greater inheritance rights, 26% said both should have equal rights (p. 203). 75% said sharia is the revealed word of God, 20% said it is developed by men based on the word of God (p. 194). 18% said the laws of the country follow sharia very closely, 21% said somewhat closely, 39% not too closely, 17% not at all closely, and 6% dk/ref. (p. 195). The above list of results overall seems to show at least as much unity as diversity. Aslan's diversity claim happens to be consistent with my last listed item showing a wide divergence of opinion on how closely the laws of the country follow sharia (Q68), though this was reported for the general sample, not the 74% subset to which Aslan referred. (According to my analysis of the data file, there is a wide divergence of opinion among Egyptian Muslims on Q68, whether they favor or oppose sharia). The results for Q67, which asks whether sharia law has one true interpretation or should be open to multiple interpretations, weren't available for Egypt due to “an administrative error” (p. 195). Having presented that summary, I will leave it to the reader to interpret Aslan's response to Hayes' question. Honoring your request to move discussion from Twitter, Pew Research laid the foundation for the misunderstanding of its report. The report supposedly addresses the attitudes of Muslims, yet in the section of the report dealing with attitudes toward apply the death penalty for apostasy, all the data refer to the subpopulation of Muslims who favor sharia. Sure, page 219 has the data for Muslims in general, but where's that information in the body of the report? If one used a search for "apostasy" on the PDF (like I did), they'll only find data applying to the aforementioned subpopulation. The report effectively buries the information you (rightly) point out on Page 219. Hi Bryan. This is much easier. I just started using twitter recently. I agree that Pew should have presented the general stats up front, before the subset data. I do think that contributed partly to a lot of people misunderstanding the subset info. I think Pew underestimated the potential for misunderstanding on this one. (In previous reports, they presented general figures [up front] for the apostasy and adultery questions, for example). That said, as I mention in note  in my article above, Pew mentions where to find the "questionnaire and a topline with full results," and the Topline pdf is the same as what's in Appendix D of the Complete Report. For searching, p. 55 in the Complete Report gives the question number Q92b, and searching that takes you to p. 219. There is of course no p. 219 in the web version, but again, the web version at least gives the link to the Topline pdf (which does have p. 219), and in any case the Complete Report pdf is available from the top of the opening page of the web version. A key issue is how much of the misunderstanding is due to Pew's presentation, and how much is due to readers rushing through too quick and not being careful enough about what they then conclude and report. For those who extrapolated numbers to end up with numbers the same or similar to what Fisher presented, I think it's clear that not enough questions were answered or explored in their preparation process, given everything that Pew provided. One needs to know the wording of the question, the percentages who opposed, didn't know, etc. If you look for that info in what Pew provided, you should find it. If you don't find it, you can contact them to find out. It also helps to look at previous reports by Pew on this subject. The previous reports have a similar layout, with the general results in the back or in an appendix with "Topline" results. I think there is also a greater burden of responsibility on writers to do a much more thorough and active read than, say, a casual reader who's just browsing a few areas of interest. If you're writing about it, there's a greater responsibility. So I would [place more responsibility on] those who wrote articles about the report (or discussed it on television to potentially hundreds of thousands of viewers) more than I would those who were only discussing it casually. But I focussed in my discussion in the above document on those who not only got the numbers wrong, but especially on at least two of the journalists and one scholar (Aslan) who are supposed to be knowledgeable about this area, and who--remarkably--persisted with the error (or didn't acknowledge or correct it fully) despite being warned and corrected at least once. Most of the other cases I list in Appendix IV were not as bad, though the Nida Khan and Cenk Uygur errors were pretty bad. In any case, kudos to you for acknowledging the error. I don't disagree with anything in your reply. Nor does it look like you disagree with anything I posted here. I take responsibility for my error in not finding the information on the general Muslim opinion on apostasy, but at the same time it's fair (as you appear to agree) to point out how Pew made the error easy to commit. Any stated reference in the report to the attitudes of Muslims generally to the death penalty for apostasy would have cued readers to the existence and importance of Q92b. Hmm. I wouldn't say they made the error "easy to commit." They didn't make their report 100% optimally clear and fool-proof, but that's not the same as making it easy for errors to be committed. I think Pew exercised at least adequate diligence in presenting the information. I think, as far as survey reports go, this one is pretty clear and reader-friendly. It wouldn't be fair to fault Pew for an (arguable) imperfection, while attributing equal blame to some reporters for not exercising basic due diligence in their presentation of Pew's work. Those who reported erroneously, and/or reported erroneous extrapolations, etc., are much more to blame. Pew provided all the information any reader exercising adequate diligence would need to get a correct understanding of the apostasy data. If you're writing about the Pew report, you can't reasonably ignore something called the "Complete Report." In that Complete report, you can't reasonably ignore Appendix D, a section which constitutes roughly 30% of the pages in the document. Pew is not responsible for the erroneous extrapolation that people used. People either came up with that erroneous extrapolation themselves independently, or they got the idea from other secondary sources. (Or there could be a combination of the two. For example, they came up with an extrapolation, noted that others had obtained the same results, and took that agreement as a kind of validation). Either way, the error is not from Pew. "Pew provided all the information any reader exercising adequate diligence would need to get a correct understanding of the apostasy data." If you mean adequate for obtaining a correct understanding of the apostasy data, yeah. But that's a tautology. A person going to the apostasy section of a report on Muslim attitudes will encounter only data for the subset of Muslims who favor sharia, and will find no mention of the apostasy attitudes of the general Muslim population on the subject. I don't see that omission as easy to defend in a report supposedly addressing the attitudes of Muslims. Either Pew should have provided an explanation for its focus on the subpopulation in that section, or else provided some other cue to readers that it collected data on general population (like "See Appendix D for data on the general Muslim population"). Or both. Lacking any of those, it counts as an oversight in the preparation of the report. As you say, no communication is foolproof. But this omission is fairly glaring. "A person going to the apostasy section of a report on Muslim attitudes will encounter only data for the subset of Muslims who favor sharia, and will find no mention of the apostasy attitudes of the general Muslim population on the subject." On the opening web page, you've got the Complete Report, and the Topline Questionnaire, and within the opening page text a reference to the "full results" with a link to the Topline Q. pdf. You can't miss it if you read the report. If you peruse the Topline, you'll eventually find Q92b. In the Complete Report, Appendix D: Topline is listed in the Table of Contents. From the Complete Report, p. 37: "The survey questionnaire and a topline with full results are available on page 159." In other words, if you read p. 37, then read along further, come to p. 55 that shows subset results, and have some questions about the full results, you know where to find them: Appendix D: Topline. "I don't see that omission as easy to defend in a report supposedly addressing the attitudes of Muslims." I wouldn't say it's an "omission," at least not by Pew. You can't ignore an entire section, 30% of the Complete Report, and then blame Pew for what you omitted in your reading. The way these reports are presented, there's a Topline with full results in the back. But even if Pew had only presented subset data and no general sample data anywhere in the report or report materials, that still doesn't justify some people making erroneous extrapolations. If some people thought they were stuck with only being able to report subset data and didn't want to investigate further, then they should have just reported the subset data. They shouldn't have ventured into extrapolations based on inadequate information. "Either Pew should have provided an explanation for its focus on the subpopulation in that section, or else provided some other cue to readers that it collected data on general population (like "See Appendix D for data on the general Muslim population"). Or both. Lacking any of those, it counts as an oversight in the preparation of the report." I don't think it's an oversight. Q92b is a cue on p. 55. For one thing, you need to know the wording of the question. That's provided in the Topline/Appendix D. You need to know what percentage opposed, didn't know, etc. Searching for Q92b will take you to p. 219. Also, scrolling through past p. 159 will take you to the full results for all of the questions in the report, including Q92b on p. 219. As I said before, their presentation is not optimal. I believe that general data should be presented before subset data, but that's not a sufficient excuse for people not reading the whole report or not looking for all the relevant information. And it's not an excuse for the errors that some people produced. What I think Pew should have done, after the error became widespread, was publish a corrective article explaining the error. That way people would have an authoritative correction. Pew has obviously invested a lot in this research, so they do have a strong interest in ensuring, as much as they can, that the public has a correct understanding of the data. "On the opening web page, you've got the Complete Report, and the Topline Questionnaire, and within the opening page text a reference to the "full results" with a link to the Topline Q. pdf. You can't miss it if you read the report." If you're not saying that reading the whole report will cause one to eventually read something that's in the whole report, I'd like for you to clarify what it is you're saying. "If you peruse the Topline, you'll eventually find Q92b." In the Topline, there's is no information regarding what subpopulations were asked the questions. As such the Topline document offers no clarification of the subpopulation issue created by the ambiguity in section of the report addressing punishment for apostasy. It's one thing for a report to fail to guarantee understanding. It's another thing to put important information in out-of-the-way places while omitting cues to the reader to look for that specific information. It's a stretch to call Q92b a cue. Nobody's going to read "Q92b" and think "A-ha, that's where to look for the results of the apostasy question as posed to the general Muslim population!" That's about as vague as a cue can get. And going to Q92b doesn't inform the reader that the question was addressed to the general Muslim population, either. One would have to notice a discrepancy in the numbers and either assume the discrepancy stems from addressing 92b to the general Muslim population or ... ask the authors. If asking the authors is necessary then the report isn't clear on its own. "I wouldn't say it's an "omission," at least not by Pew. You can't ignore an entire section, 30% of the Complete Report, and then blame Pew for what you omitted in your reading." Kindly point me to any part of the report that clearly states Q92b was addressed to the general Muslim population. "By contrast, fewer Muslims back severe criminal punishments in Southeast Asia (median of 46%)"
That 46 percent matches the figure on the adjacent chart, which is described as applying to those Muslims who favor sharia. Very shortly after that, the introductory page invites the curious to find out more about views on apostasy in the main report (which, as previously noted, presents *only* information about Muslims who favor sharia). Follow that link to find out more about Muslim views about sharia and you won't find out about the general Muslim view without looking up Q92b and assuming it was asked of Muslims generally (going by the report contents and Topline document). If I did that I'd admit it was a mistake. "that's not a sufficient excuse for people not reading the whole report or not looking for all the relevant information." You don't need to convince me on that point. First of all, thanks for making the correction on your site. "In the Topline, there's is no information regarding what subpopulations were asked the questions. As such the Topline document offers no clarification of the subpopulation issue created by the ambiguity in section of the report addressing punishment for apostasy." The wording of the questions (and/or some instructions to the interviewer) in the Topline does contain information about what population or subpopulation was asked. As I pointed out in Appendix I, above, the wording for Q81 for example indicates that it was asked only of those who favored sharia. I'll quote it here: "ASK IF RESPONDENT SAYS FAVOR IN Q79a (Q79a = 1). Q81. Should both Muslims and non-Muslims in our country be subject to sharia law, or should sharia law only be applied to Muslims"
In contrast, the wording of Q79a has no specification of a subgroup. We know or have strong reasons to believe from the report (e.g., p. 46 of the Complete Report, also see the same section in the Main Report) that Q79a was asked of Muslims generally. If you look all through the Topline, you'll see most questions have a general wording, with no conditional (subset) specification, whereas a smaller number of them do have a specification. (Another that has a subset specification is Q11, which I quote in my article). Q92b is the same as Q79a in that there is no specification of a subset. No specification of a subset means it's of the general sample of Muslims. The second piece of evidence in the Topline section occurs in the tables, and at the bottom of the tables. As I noted in Appendix I, the sub-Saharan African countries (except Niger) in the table for Q92b were surveyed in 2008-2009, and the note at the bottom of that table refers to that (2010) report. When you go to that report, you find that the apostasy question (same question but with a different number code) was asked of Muslims generally and the results were reported for Muslims generally. The fact that those results on p. 219 of the 2013 report are in the same columns as the data collected later (2011-2012) from other countries indicates that they are all for the general samples. Any differences would have been noted on p. 219 (2013). The only difference noted there, aside from the regional limitation for Thailand, is that the data for the countries with an asterisk were obtained at a different time and reported previously. As you yourself noted earlier, and as I noted in Appendix I, the (2013) report is clearly about the opinions of Muslims. If the report doesn't specify or imply a subset of Muslims, then the default assumption is that it's referring to the general sample of Muslims. "...the Topline document offers no clarification of the subpopulation issue created by the ambiguity in section of the report addressing punishment for apostasy." The sharia section of the text of the report addresses apostasy (p. 55) among other issues. The section is about Muslims' beliefs about sharia, the apostasy data are presented in that context, and what's presented there is described clearly as of the sharia-supporting subset. That's not ambiguous. It's a subset. It can be contrasted and compared with the p. 219 data. The Complete Report and Topline Questionnaire are not in “out-of-the-way places.” They are there for the reader at the top right of the screen when you open up the web page version of the report. Also, the first page of the web page overview tells you the “full results” are in a pdf for which it provides the link. Second, the Complete Report has a Table of Contents. It is a pdf. It is searchable. Third, more is expected of the writer than of the casual reader. "Out-of-the-way places," even if it were true, isn't a valid excuse for a writer, who is expected to find and understand all relevant aspects of the report. If readers think they don't have the information they are looking for, they should try to find it. “Full results,” “Complete Report,” “Topline Questionnaire,” “Q92b” are cues, clues, indications for those who are seeking more information. It's the exact number of the question you are looking for if you are seeking to find important additional information, including whether the question was asked of the general population, its exact wording, what percentages opposed, didn't know, etc. They number the question and cite it in the report so that you can look it up and find additional information about it. If you search it in the Complete Report or the Topline Questionnaire, you'll find it. The main report web page tells you where to find the full results and gives the link to the Topline Q. with those full results. As I noted above, and in Appendix I, the question is worded without any specification of a subset, in the context of the Topline which does have some other questions that, by contrast, do specify a subset. The discrepancy in the numbers (p. 55 vs p. 219) is obvious. The idea that the difference stems from p. 219 being from the general sample fits with the fact that the wording of the question is general, and from the other information I mentioned. For some issues, in any area of research, it is necessary to contact the researchers for more information. It's not unusual for journalists who are writing about scientific research to contact the researchers/authors for clarification on some issues. There is a much greater responsibility on writers to obtain verification, even if an interpretation seems to make sense. In this case, though, my view as expressed in Appendix I is that the diligent reader has enough resources available online in the 2013 and 2010 reports from Pew to determine that p. 219 refers to the general sample. "First of all, thanks for making the correction on your site." No thanks necessary, though it's appreciated. I have the "Report and Error" icon featured on the site for a reason. I'm serious about getting things right, even if it takes more than one try. While I appreciate the depth and length of your reply, only select parts of it interest me in terms of my response. This will be my last word on the subject unless you surprise me with something you haven't already expressed. "The wording of the questions (and/or some instructions to the interviewer) in the Topline does contain information about what population or subpopulation was asked." Not with respect to the apostasy issue. As you note later, one gleans the information about the population involved in Q92b by using a default *assumption*. That assumption is only a strong assumption based on a nearly complete reading of the report. I say the report should be written clearly enough so that one does not need to read nearly the whole report to confirm that a chart in the appendix contains the only clear information about general Muslim attitudes toward the death penalty for apostasy. If I'd written the report that way I'd consider it a fault in my presentation, one worthy of correction. Plainly you disagree. I don't think we'll get beyond that disagreement. "It's the exact number of the question you are looking for if you are seeking to find important additional information, including whether the question was asked of the general population, its exact wording, what percentages opposed, didn't know, etc." You're describing a reference for more information, not a cue regarding specific information. I gave an example of that type of cue. The report would improve with the type of cue I mentioned. "The discrepancy in the numbers (p. 55 vs p. 219) is obvious." Yes, if one is looking at the numbers for a discrepancy. But that's a poor way to clarify in drill-down fashion that the Q92b was asked of the general Muslim population. It leaves the reader to wonder why, in a report on the attitudes of Muslims, the results of Q92b do not occur in the subsection on attitudes toward punishment for apostasy. Again, cues to the reader such as I mentioned earlier would have improved the report ("We focus on the section on Muslims who favor sharia ... For data on the general population of Muslims see Q92b"). Such fixes are easy. "For some issues, in any area of research, it is necessary to contact the researchers for more information." To paraphrase you, that's no excuse for the Pew researchers making its treatment of the apostasy issue needlessly vague. In a report on the attitudes of the general Muslim population one should be able to look at the section on the death penalty for apostasy and find information relating to the general attitude of Muslims. Anything else is an insult to the commonly understood organizational principles of expository writing. Thank *you* for bringing this matter to my attention, by the way. Cheers. I am a researcher with a degree (MSc) in psychological research. Copyright © 2015-2019. Empethop. All rights reserved. Simple theme. Powered by Blogger.